I’ve taught and watched baseball catcher drills for years and it never ceases to amaze me the grit and toughness these players demonstrate on a daily basis, not only physically, but mentally and emotionally as well. However, I’ve seen catchers who have a rifle for an arm and a rocket launcher for a bat who were told to pack their bags. Why? They couldn’t handle a pitching staff. By handling a pitching staff I don’t mean having everyone like you or always bringing the bubble gum and sun flower seeds to the game, as a mascot can do that much and probably be much funnier. I’m talking about being the personal coach to each pitcher and knowing when he doesn’t have his good fastball that day, no matter what he may think, or the resident psychiatrist and knowing when your pitcher isn’t concentrating, and being able to motivate him back on track. You’ll have to have a photographic memory to remember if the upcoming batter hit an inside fastball screamer or looked slightly intoxicated trying to wave at the curve ball, because I’ll just about guarantee you, your pitcher won’t remember. Normally, just being on the same team, unless there’s very unusual circumstances, is enough to build camaraderie between players, but a catcher, by nature of the position he’s playing, has to be more than a team mate, he has to be a Trusted partner. (1.) He can’t let any pitch get by him, although the pitcher seems intent on bouncing every other ball off your shins or hitting the back stop…. (2.) He always seems to call the right pitch…. This trust and confidence building comes through shared experiences and history together, and can not be rushed, but by being ahead of the game you can quicken the process, which is imperative. You can’t wait till mid season to develop a relationship with your pitching staff, it’ll be too late, for you and the team. You can not expect your pitching staff to respect and trust you if you don’t respect and trust your own skills, and there’s a huge difference between arrogance and confidence. Arrogance has to proclaim itself … Confidence Silently excels by performing. The only method to build confidence is hard practice, practice and more practice. (1.) Always be available for bullpen work. 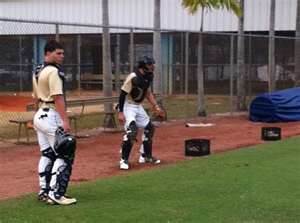 There is no better place to learn your trade and your pitching staff than by catching them while in the bullpen. 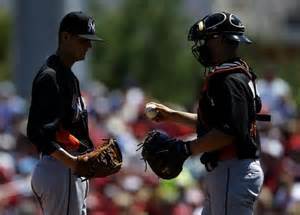 You learn the pitcher, he learns you and familiarity is built. The more reps you take as a catcher the better you become with the catcher’s mitt, the better you learn to shift your weight to the ball without having to think, the more the protective equipment becomes a second skin. (2.) If there are no pitchers to catch, or if it’s an off day, go to the batting cage and catch the pitching machines. So they’re called batting cages, does that mean you can only hit the balls, you can’t catch them as well. Always wear your entire compliment of protective gear, not only for safety but to acquire the feeling of the equipment being natural and un-restrictive. I know I keep repeating that, but a catcher uncomfortable in his equipment can not perform. Period. In pre-season, you may not know how your pitchers will react in Real Game Conditions, but by now you should have caught and talked to them enough to have a pretty good idea of your each pitcher’s abilities and their egos, which can have a direct bearing on their game. Handling a pitcher who throws 85 mph with an average curve ball and never questions your call, is much easier than a pitcher gifted with a 93 mph fastball and a slider with a hard downward break, who has the ego of an lion and the brains of a cuckoo bird. Believe me, you’ll end up catching both types in your career and it’s part of your job, and part of your responsibility to the team, to handle them by pulling the best pitching performance out of them they can give, each and every game. Let’s exam a hypothetical approach to both types of pitchers when they’re in trouble, starting with going to the mound to talk to the arrogant air head, which you will probably have to con into listening to you. “You’re fastball is really moving, but you’re curve ball is great today. Let’s stay with the curve,” pat him on the rump with your mitt and jog back to the plate before he has time to think or argue. In reality his fastball is flat and 3 mph slower than normal, which happens, but his ego would never allow him to admit it. You have stroked him about his fastball, but insisted his curve ball was the best he’d ever thrown. The curve ball is what you went out to convince him to throw, and you did, just in a different manner. Were you a bit dishonest? Maybe, but like swatting a child’s hand who is reaching for a hot stove, it’s for his own good. Your approach to the average, 85 mph pitcher is totally different. “What do think .. Curve or fastball?” you’ll ask. “Fastball” he may reply. If you agree be sure to let him know you adamantly agree his fastball is the one to throw as to bump up his confidence. “Ok, fine, if that’s what you want.” he'll reply. See he’s not going to argue and you knew that going to the mound, but you wanted to calm him down a bit, taking the time to walk to the mound, and offer a little positive reinforcement. 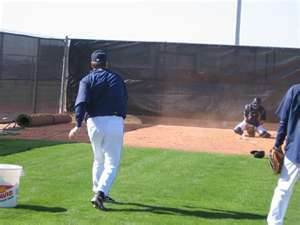 This not only commands respect from your pitchers, but you’ve saved the manager a charged time to the mound to do something which is usually his job, which creates respect. Pre-game time can be very hectic for you if you don’t have a strategy in place, and could actually end up costing you the ball game. Sounds a little drastic? Not really. I always had my catchers review the infield to determine if they detected a crown to the field. To check the field crown, simply roll a baseball, @ 3’ inside the foul line, down each foul line at medium speed. Watch the ball to see if it maintains a straight line or veers off to either side, fair or foul. 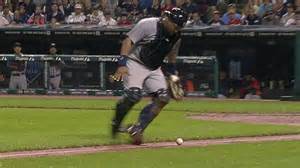 This can be a game changer if during the game the opposition lays a bunt down the line which appears will be successful, however, knowing ahead of time, due to the crown, there was a good chance the ball would roll foul, the catcher would call off the third baseman and allow the ball to roll. If it stopped fair, the runner was going to beat it out anyhow, but if it rolls foul, he’s back to the plate with a strike on him. Check the field every time even if you have played on it before, as this is not the major leagues and depending on who drags the field, the crown could have changed. Let’s learn some additional pre-game preparation drills. (1.) A catcher has a tendency to worry about everyone but themselves, but catchers must be sure to take adequate time for themselves and take time to amply stretch prior to the game. You won’t help anybody but the opposition if you pull a hamstring because you didn’t properly stretch and can’t play anymore. (2.) You must work your pitcher and determine how his velocity is, does his curve ball have good tight spin, how’s his change up, everything you need to know about his pitching performance that day. Mentally record your appraisal as you’ll need it to initially call your game and later on to detect if any of his pitches increase or decrease in efficiency as the game progresses, as it occurs both ways. You have come a far piece since opening day of practice. You’ve learned the idiosyncrasies and abilities of each pitcher on the staff, and you have practiced until your own skills are finely tuned and ready. You’ve learned the beginning of creating a catcher strategy as you go into the game. You are ready for the next step. Baptism by fire, the first game of the season.